Eukaryotic cells maintain a dynamic and complex network of membrane compartments, such as the endoplasmic reticulum, Golgi apparatus, endosomes, and vacuole/lysosomes. These compartments separate and organize proteins within the cell and impose temporal as well as spatial restrictions on protein activities. Compartment identities are maintained in spite of a constant exchange of material. This process of continuous generation and consumption of compartments defies any simple analogies with static macroscopic structures and membrane compartments should rather be compared to waves, whose very essence is the dynamic flow of material through them. The complexity of the membrane compartments of plant cells are only insufficiently appreciated, especially for cells in the context of the whole plant. One of the problems is that many membrane compartments have an inconspicuous morphology, especially at the current resolution of fluoresent live-imaging. Therefore, they can only be distinguished by co-localisation with spectrally distinct fluorescent markers. At the Salk Institute, we developed a vector series for plant transformation for a non-Gateway-based recombination . This vector set allows the use of a recently developed Arabidopsis ORF library for large scale generation of fluorescent fusion constructs in plants. These vectors are an alternative to Gateway. Their CRE/lox system is non-patented, cheap and compatible with the Arabidopsis ORF collection, currently encompassing about 13.000 clones. We used this system (Liu et al., 1998) to generate a large set of membrane compartment markers. This set allows the definition of compartments and trafficking pathways in a developmental context and does not rely on transient expression in protoplasts or cultured cells. Our set of transgenic plants with yellow, red and blue variants of compartment markers is now established and has been published (Geldner et al., 2009). American researchers can order from there while the stock are being transferred to the ABRC. Geldner N, Dénervaud-Tendon V, Hyman DL, Mayer U, Stierhof YD, Chory J. Rapid, combinatorial analysis of membrane compartments in intact plants with a multicolor marker set. The pNIGEL vectors were developed to allow optimal co-localisation between lines carrying different fluorescent protein fusion constructs. The three fluorescent proteins chosen can be easily separated spectrally. The Cerulean and mTFP1 vectors contain an additional 3xHA tag, the EYFP vector contains an additional 3xMyc epitope. Vectors of different colours carry different resistances, such as to allow selection of crossing products and/or sequential transformations with different constructs. Marker expression is driven by the intron-bearing, endogenous UBQ10 promoter, in order to promote stable expression levels and minimise overexpression artifacts while obtaining sufficiently strong signals. 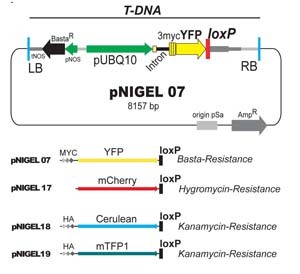 pNIGEL vectors are based on the pGREEN II vector series, in which the bacterial Kan Resistance was exchanged against Amp Resistance. For additional information, please refer to the publication (Geldner et al., 2009). The pNIGEL vector series can also be ordered at NASC. Sequence information can be downloaded from Genbank. Example sequences of recombined Wave constructs can be downloaded below as genbank files. In order to obtain the exact sequence of your construct of interest, just exchange the example NPSN12 ORF with your ORF of interest (including start and stop codon). Copyright © 2019 The Geldner Lab. Powered by WordPress. Theme: Accelerate by ThemeGrill.